Orthodox Greek Catholic Church of St. Peter and Paul and Roman Catholic of Epiphany. 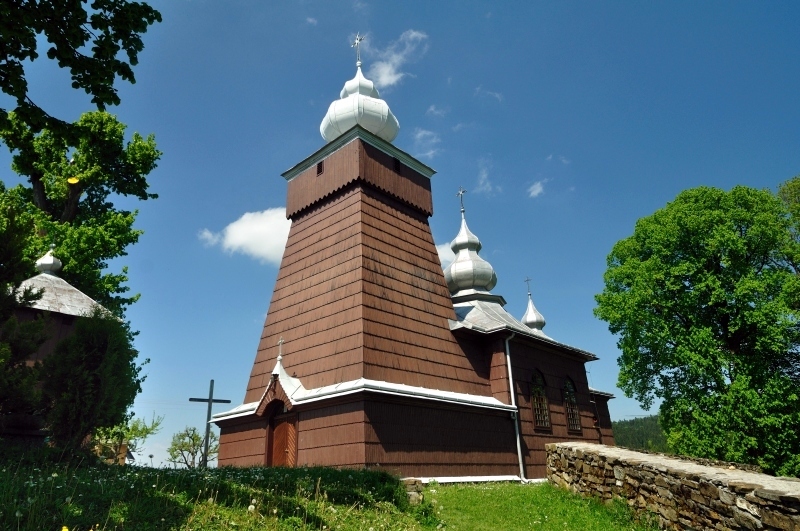 Church of the Epiphany was built between 1872 – 1857 according to the Orthodox Church architectural traditions. Brick and stone, partly plastered. This church consist of the nave and transept which closes the narrower presbytery from an adjacent sacristy. The building has a roof with seven onion domes turrets with blind lanterns. The front tower is covered with a cupola with a lantern. The whole is covered with tin. Only four side altars out of the whole original equipment from the 19th century survived to our times. It was built between 1983-1996 of brick, along the lines of the traditional Orthodox church building. Inside there is an iconostasis and some icons. In the vestibule - the historic picture of the scene of Last Judgement and cut in wood scene of the Crucifixion, dating probably the end of making the iconostasis. Beautiful silhouette of the building features the architecture of the East Slavic Orthodox churches. Plaque placed in the vestibule indicates that the church is a symbol of Lemkos’ devotion to the faith of their ancestors - the Orthodox Church. The church was built between 1887-1888 to replace the Orthodox church which burnt down in 1796. It is a timbered, wooden building covered with sheet iron with a square tower of pole construction. The building is crowned with three Spherical domes with blind lanterns. The main altar dates from the 19th century. From the original equipment, only the Baroque tabernacle with a carved throne (18th century), the image of Christ, and the baroque candlestick from XIX century survived to our times. Currently, the Roman Catholic church. 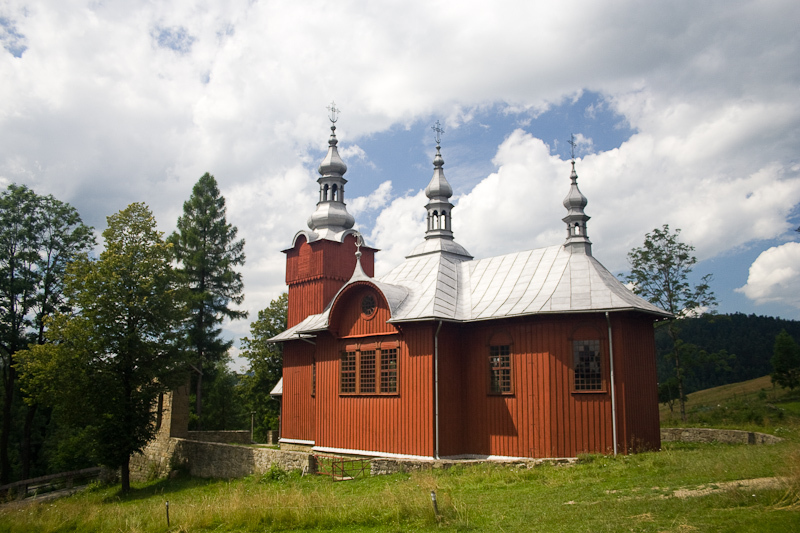 The existing church was built in 1841 in the architectural style of west Lemko churches. It is a wooden log building with the tower of pole construction. Trigeminal building with one nave. Above the nave and the chancel, there are apparent mirror arches. Roofs are shingled and covered with tin. The church is decorated by three onion dome turrets with blind lanterns. 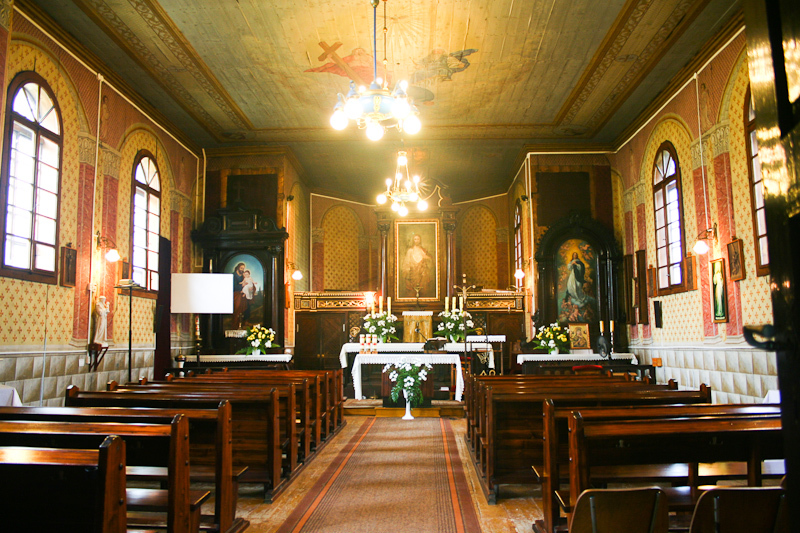 The interior decoration is typical of sacred buildings of the former Greek-Catholic " Muszyński Key”( the area of Muszyński State). Most of the monuments in the church come from 19th century, yet the most valuable are of earlier origin. Most likely, they come from the church which preceded the present one. These are: the late baroque side altar from 1729 with the Transfiguration icon and the painting" Christ in the tomb " (richly ornamented with floral and geometric decorations) and The church bell from 1707. Two popular images from a later period: "Crucifixion" (form 1854) and the icon "St Barbara" (from 1867) are also worth mentioning. The chancel and the nave houses Baroque iconostasis from late 18th century, divided in several topics. At the top, images of the Old Testament patriarchs are placed, followed by the pictures of the Virgin Mary in various periods of her life, and the Apostles at the bottom. The central part of the altar occupies the image of St.. Nicholas, Our Lady of Dawning Star, the Lord Jesus and Demetrius, the patron saint of the church. The lower part depicts scenes from the Old Testament. FORMER Greek Orthodox of Ss Cosmas and Damian, built in 1842. The wooden timbered building has three-section structure and the shingle timbered tower of pole construction. 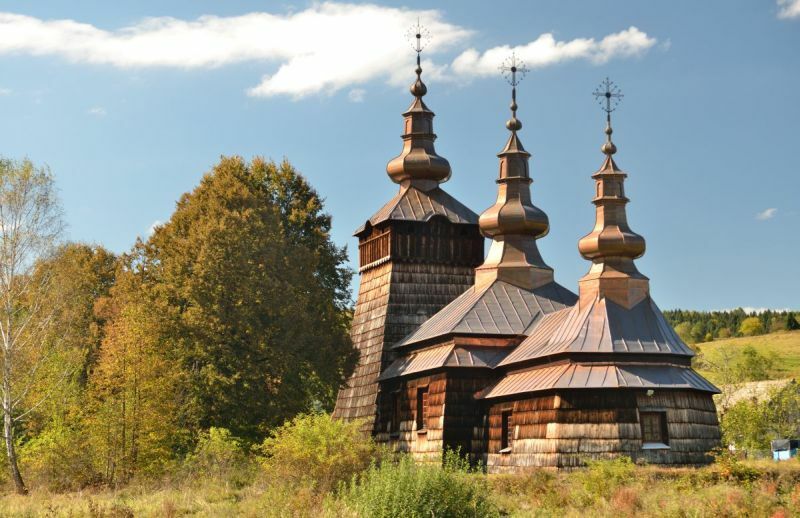 Tin roofs, towers decorated with baroque cupolas and onion domes with crosses. Internal walls are decorated with figural polychrome from 1928. 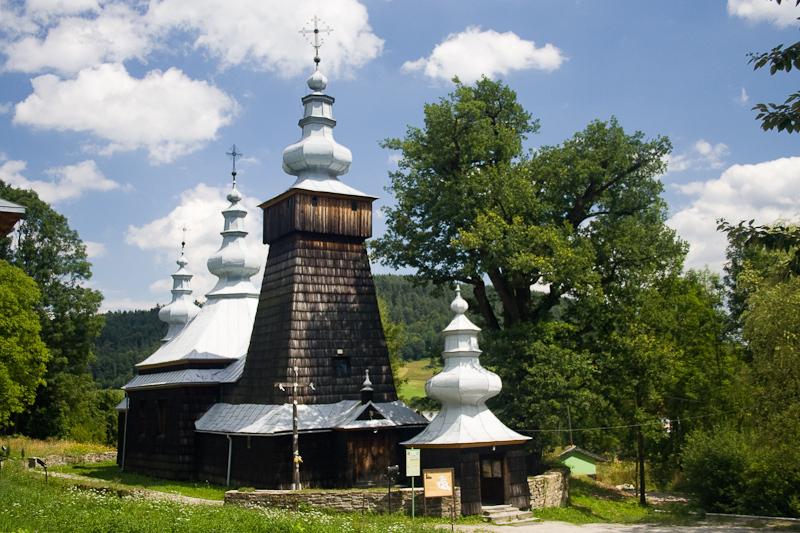 The complete equipment maintained in the Orthodox tradition dates from 17th to 20th century. 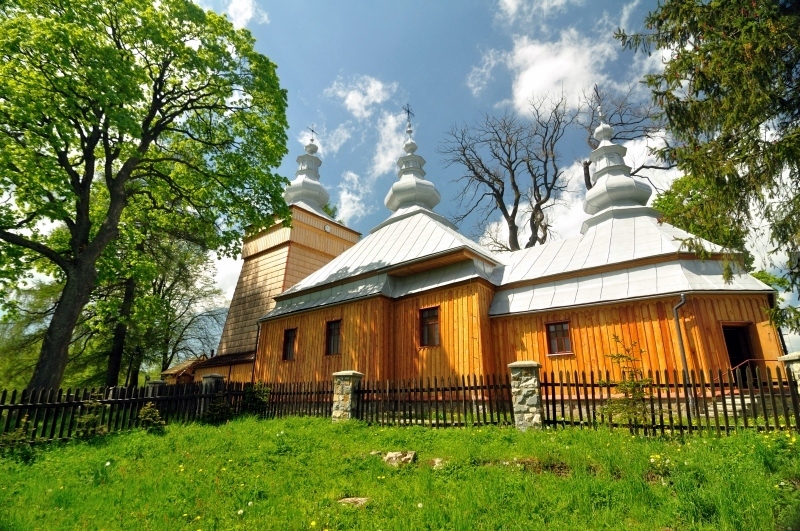 It includes iconostasis, two baroque side altars and the icon of Our Lady of Izby (painted in 1721) moved here from the church from the Izby village. timbered building, tower of pole construction topped by helmet with lanterns. The church interior, maintained partially in the Orthodox Church tradition, contains 20th century iconostasis and new equipment, placed here with the transformation of the church to the catholic rite. The Church is an example of the west Lemko architecture. Cemetery in a churchyard. 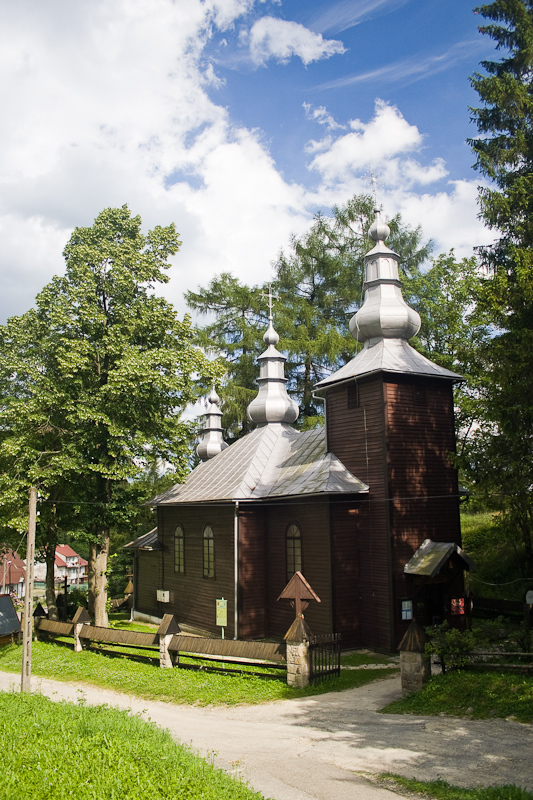 In the lower part of the village, the 19th century chapel on the Czyrnianka stream can be found. FORMER Greek Catholic church of St. Michael the Archangel. The church dates from the 17th century. It was reconstructed in 1787 and subsequently enlarged in 1846. Timber building with a tower of pole construction and a painted clock, topped by baroque helmet with blind lanterns. The oldest and wholly preserved element inside the church is the baroque iconostasis from the early 17th century. The Church also has two altars in Baroque style and a pulpit from 19th century. The church is located near the old cemetery with tombstones from 19th and 20th century. 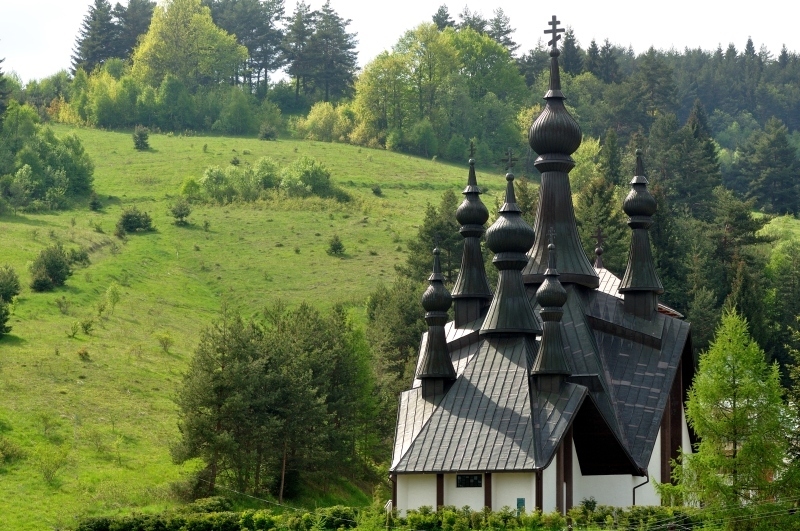 The wooden Church of St Luke, built in 1886. FORMER Greek Catholic Church of John the Evangelist was finished in 1689. Timber, three-section building covered with metal sheathing. Broken line roofs top the nave and the chancel. The church is surmounted by a tower with a spherical blind lantern. The interior contains the iconostasis from 18th century, and the lateral altar with paintings depicting Saint Barbara, transferred here (according to a legend) from the Bar Confederation field camp. FORMER Greek Catholic church of Ss Cosmas and Damian. 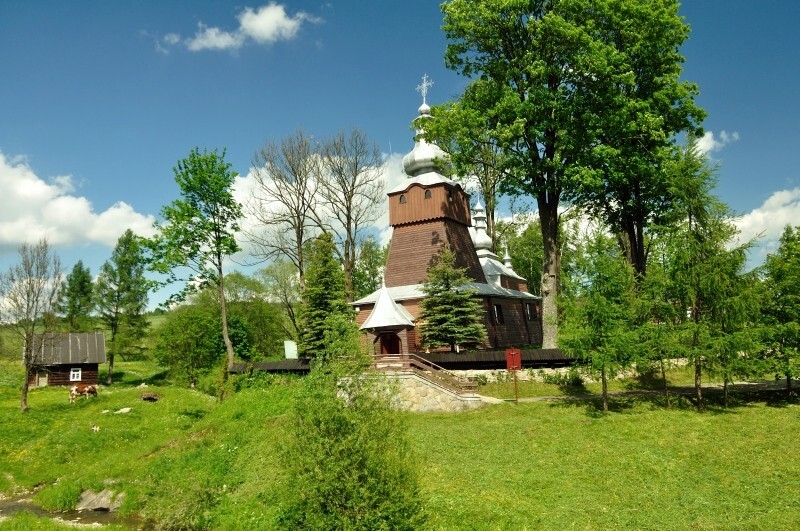 Built in 1789, the church is an example of western Lemko church architecture. 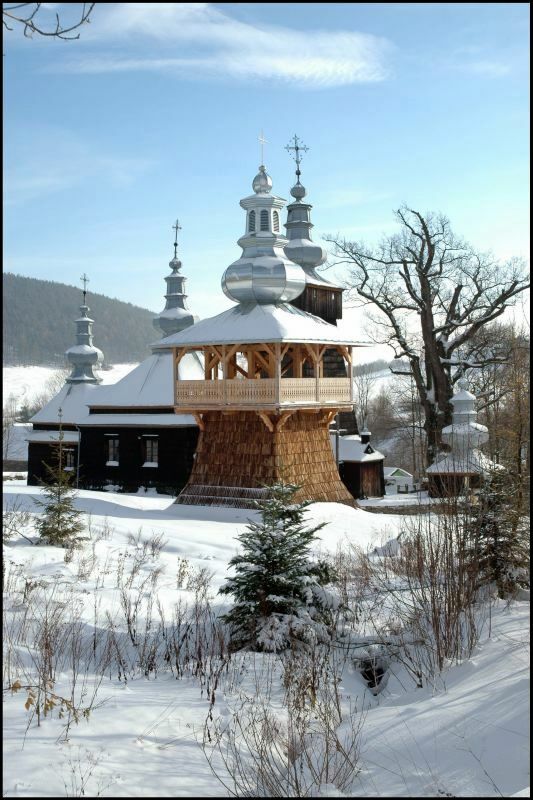 The wooden building has a three-section structure with a shingle timbered tower of pole construction, tin roofs, and towers topped with baroque cupolas and onion domes. Inside the church, Rococo iconostasis and late baroque side altars from the late 18th century are preserved. The church was renovated in 1909 and in the interwar years. 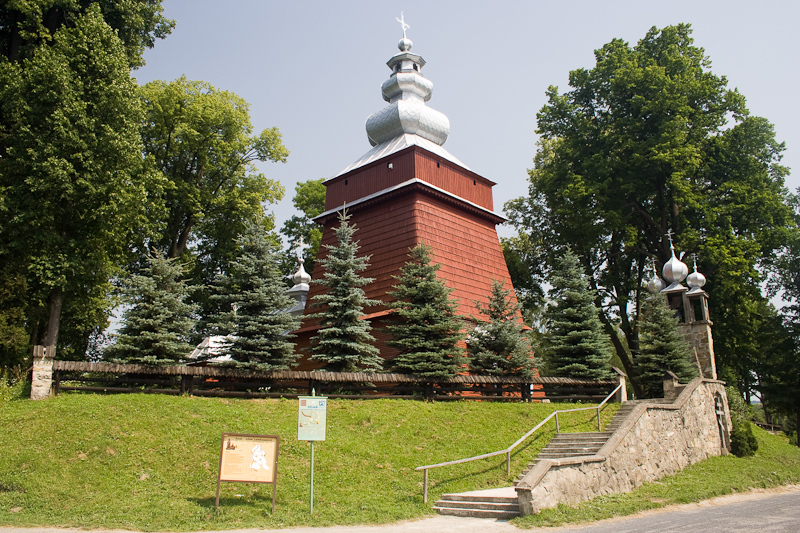 Nearby the church, a wooden bell tower and a cemetery are placed. FORMER Greek Catholic church of St. Michael the Archangel built in 1820. Timbered, bipartite structure, with shingle sloping roof. The church tower has a columnar structure with sloping walls and a place separated for women. The church is topped by three onion domes with blind lanterns. The interior contains preserved iconostasis, side altars, icons and feretories dating from 17th to 19th century, and a baroque pulpit from 1700. FORMER Greek-Catholic church of St. JAMES the Younger, Apostle. Built in 1606, currently the church of Roman Catholic rite. The building is a trigeminal wooden structure with a nave and a magnificent timbered tower of pole construction, crowned by three spherical turrets with blind lanterns. External walls, roofs and turrets are covered with shingles. The interior contains preserved figural polychromes, the main altar with an Virgin Hodegetria type icon, iconostasis, some unique icons dating from 17th century and a pulpit from 1700. The tower bell of the church dates back to 1615. 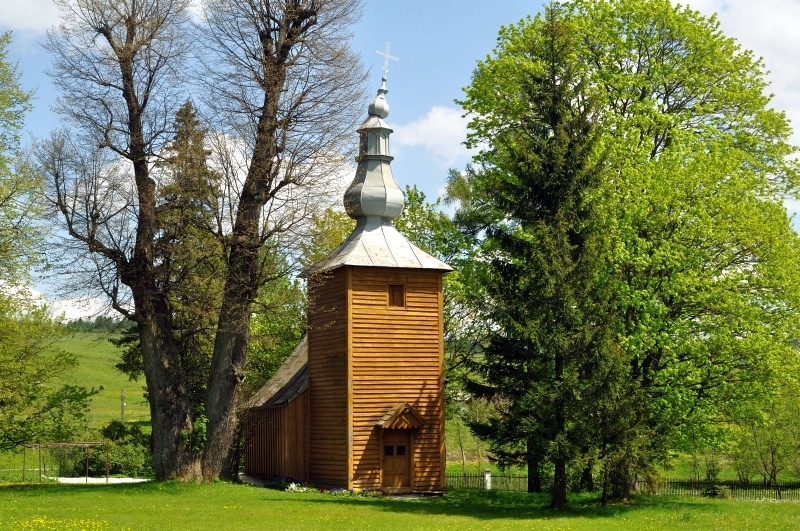 The former Greek Catholic Church dedicated to Cosmas and Damian dating from 1743 is an example of west Lemko church architecture. The church was renovated in 1930s. 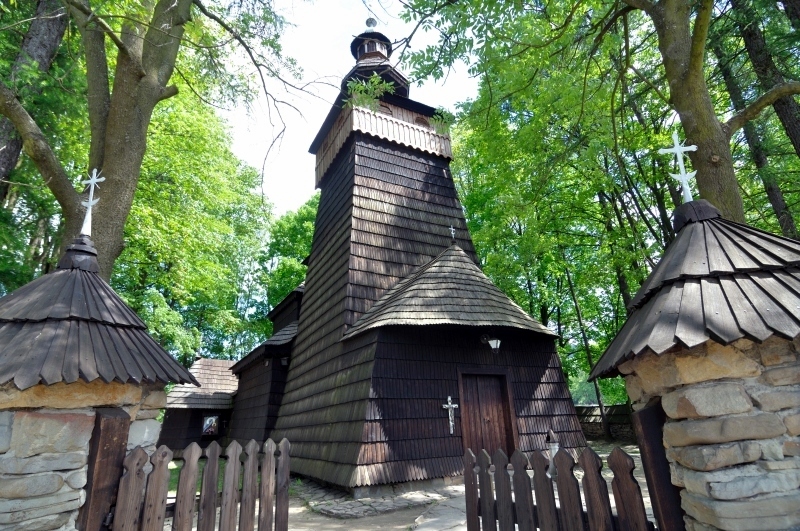 Timbered building with tin roofs, towers decorated by baroque cupolas and onion domes with crosses. The interior contains furnishings of an orthodox church. The wall-paintings from 1938 commemorate the 950 anniversary of the Baptism of Rus. The church iconostasis dates from the mid 18th century.